The birds of the air build nests by the waters. They sing among the branches. 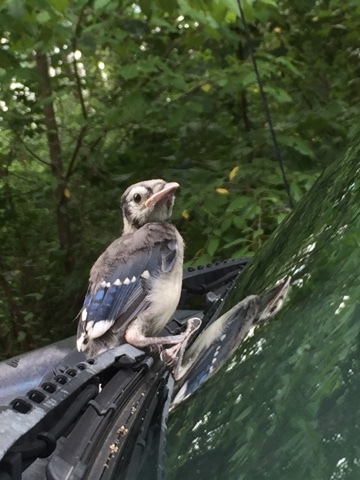 This sweet half grown bird perched on my husband's truck this afternoon. Have I mentioned how many cats we have on the farm? My daughter watched it fly away and noticed a full grown bird in the branches nearby, apparently watching out for it. Isn't it beautiful to see God's love reflected in His creation? Great photo, and I so love the truth of that scripture! Such a sweet tiny bird - yes, nothing is too little or too big for God's care and love! Sweet! We have quite a few blue jays around here, but they nest further away so I don't ever see babies!